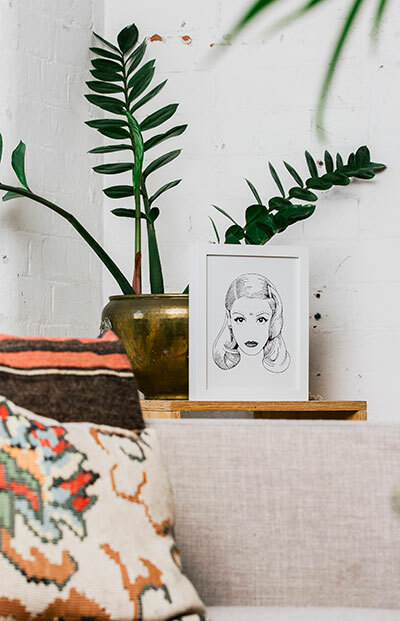 Should you get a framed piece or unframed print? What sized art would best suit your home? Hanging Tip: If you can’t use nails on your wall, 3M Command Hooks are a great option. You can choose to have your art print sent framed or to be sent unframed (just the print). Customers in Australia have the option of receiving art prints framed by Natalie Ex for a reasonable price. The frames are from IKEA and feature a glass look, plastic front instead of glass. These quality, affordable frames are ready to hang or stand as soon as you receive them. I use them all around my own home too. Although framed pieces are available for delivery worldwide, the unframed option is recommended for international customers as postage prices to send frames abroad are pricey. Finding a frame for your print locally will be easy. Natalie Ex art print sizes are either standard paper size or IKEA frame size. Tips on where to find a frame for your unframed prints can be found below. Natalie Ex art prints and framed art pieces come in a wide range of sizes to suit your home decor needs. They are designed to work together so that you can mix and match as you please. Smaller sizes are perfect to display standing instead of hanging! Stand amongst plants and books on a shelf, or on a bedside table or work desk. If you are looking for the perfect wall to hang a smaller sized piece by itself, I recommend choosing a cosy spot like the end of the hallway, or by the front door. You can decorate a larger wall by combining a few smaller pieces to arrange in a grid, line, or scatter around feature pieces. These sizes are big enough to make a statement, but in a subtle way. Do you have a large space that is bare and lacking character? Choose a large sized feature piece! It will instantly give your home or apartment a modern update. 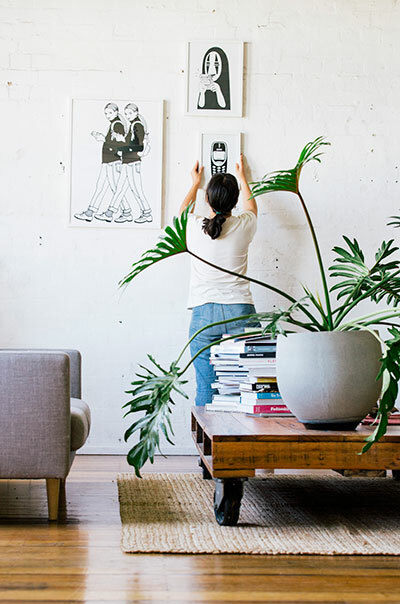 Getting your new art print framed by a custom framer is a beautiful investment. You can frame a print of any size, exactly how you like. 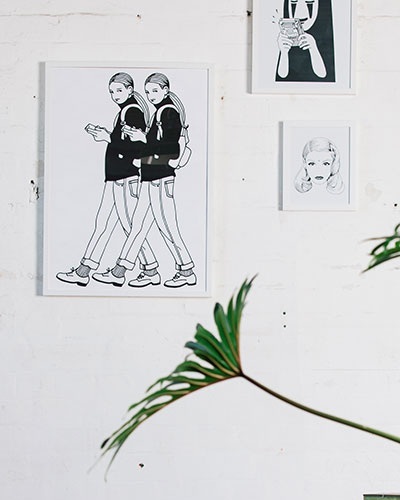 I often recommend thin black or white frames for a modern look that suits my drawing style. Black brings the eye in, white is light and bright. Both excellent choices! Trust your gut, if you like a frame and think it will match your decor, it will work a treat!